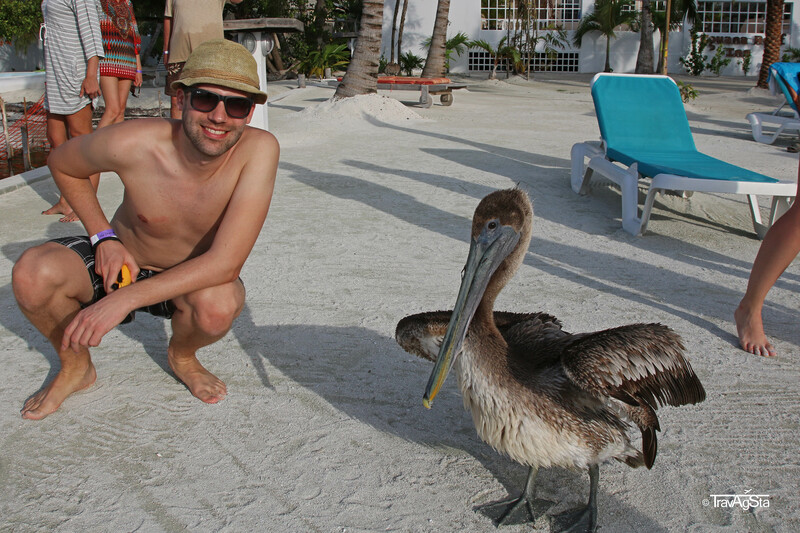 ‘No shoes, no shirt, no problem’ – that’s the motto of the paradise island named Caye Caulker. In general, they are really creative here (see also the headline). 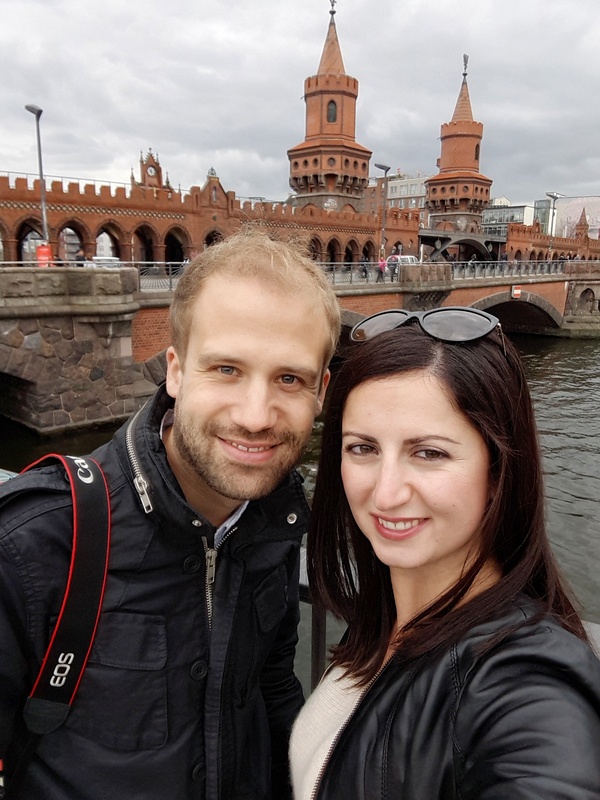 For the second part of our trip, we planned three nights and would have loved to stay longer. 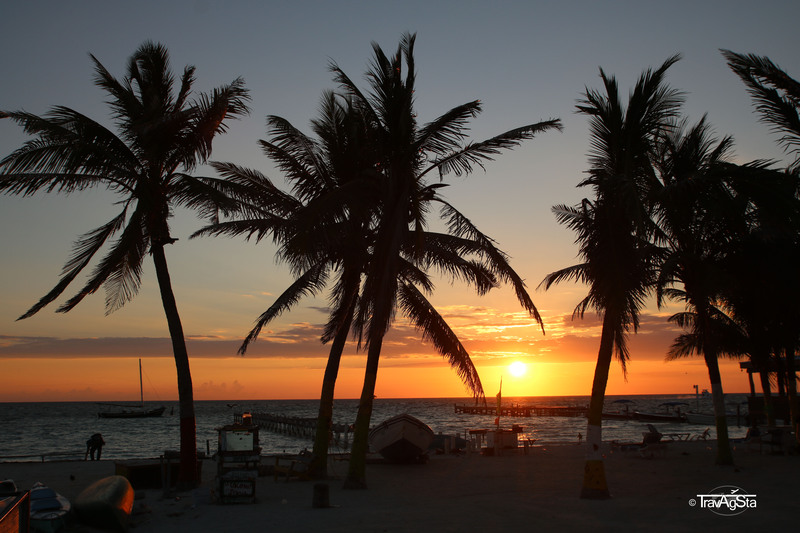 There’s hardly a place on earth that’s more relaxed than Caye Caulker. 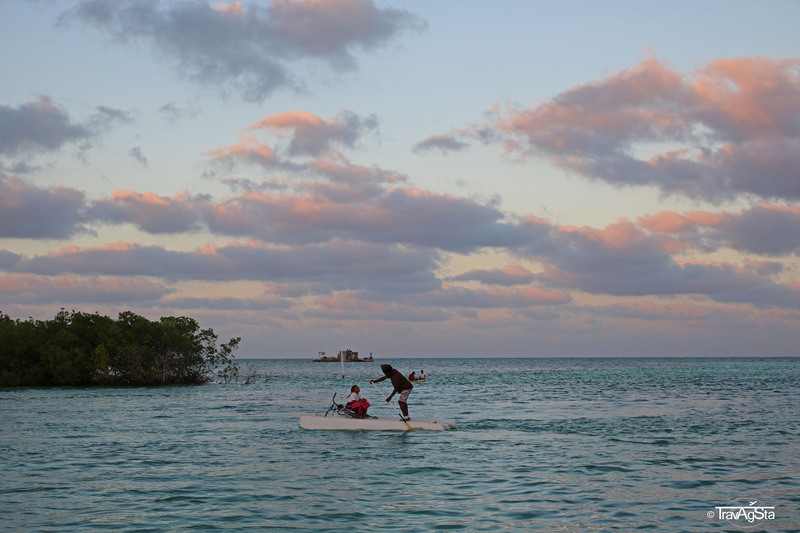 Thanks to the locals’ relaxed attitude even the most cramped person will relax and enjoy the moment. 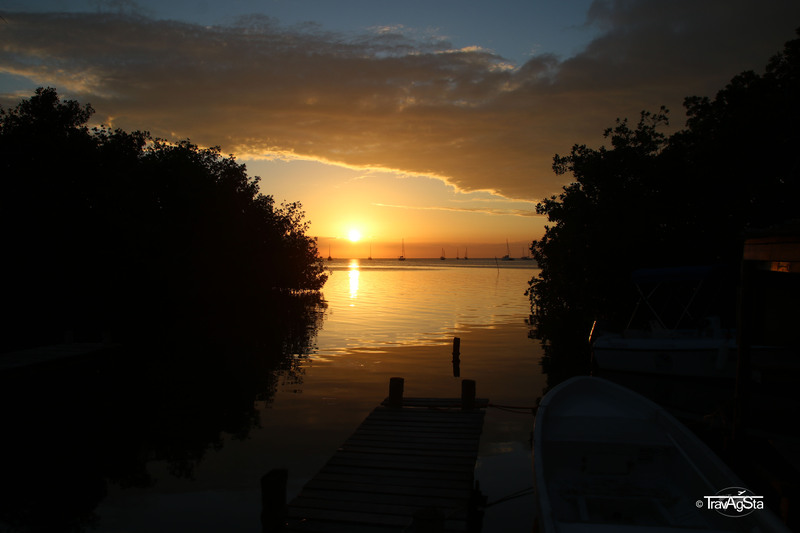 If you want to combine relaxing and activity, Caye Caulker is perfect for you. And that’s what we did during the short time we spent there. For the locals, every day is a good day when the sun comes out. 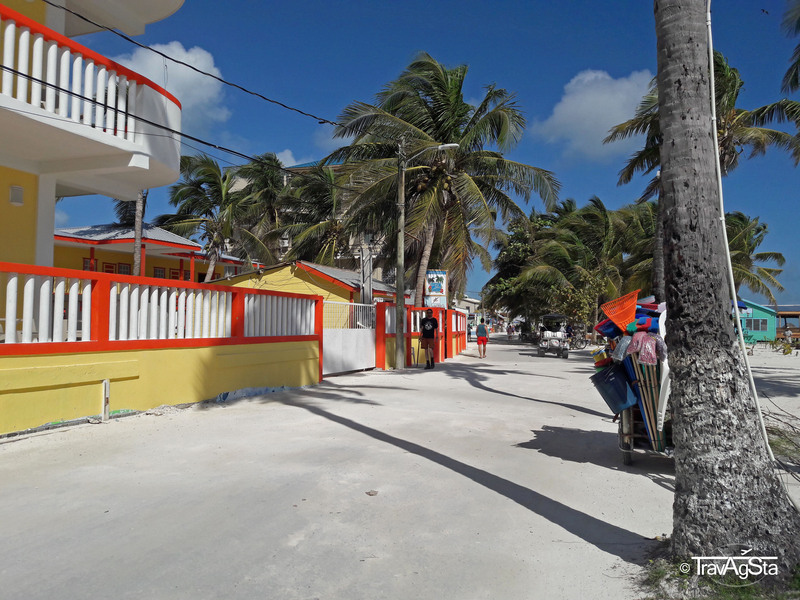 Which is the case on Caye Caulker almost every day. The Caveman (owner of the tour company named after him) asked us before our departure: ‘Have you received the gift today?’ At first, we didn’t know what he was talking about. Then he explained what he meant with the gift: The sun; that we’re doing well; not getting upset about the small things and just enjoying life. What a wise man. More on Caveman and the boat trip, see below. Some of you maybe wonder how to get there. We had a rental car, so we headed to Chetumal (Mexico) where we booked a guarded parking near the port. 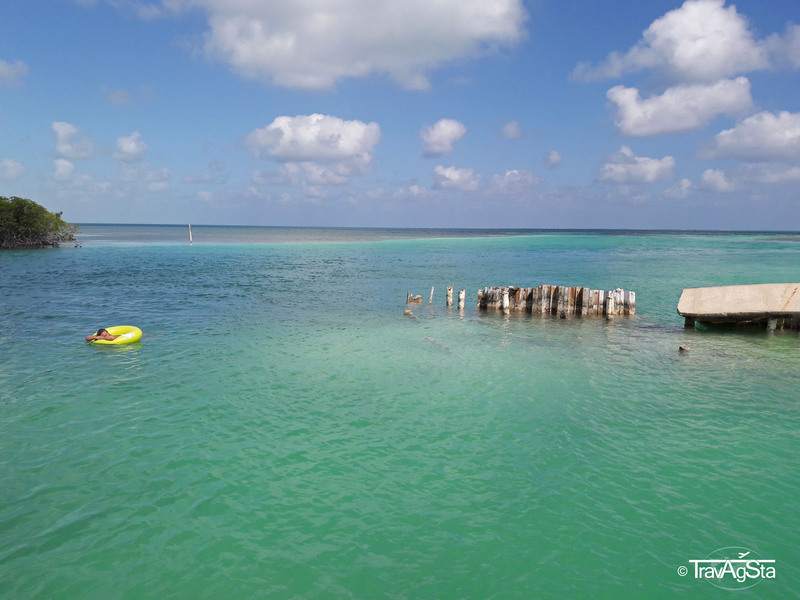 From there we took the speed boat to Ambergris Caye where we had to go through the immigration process. 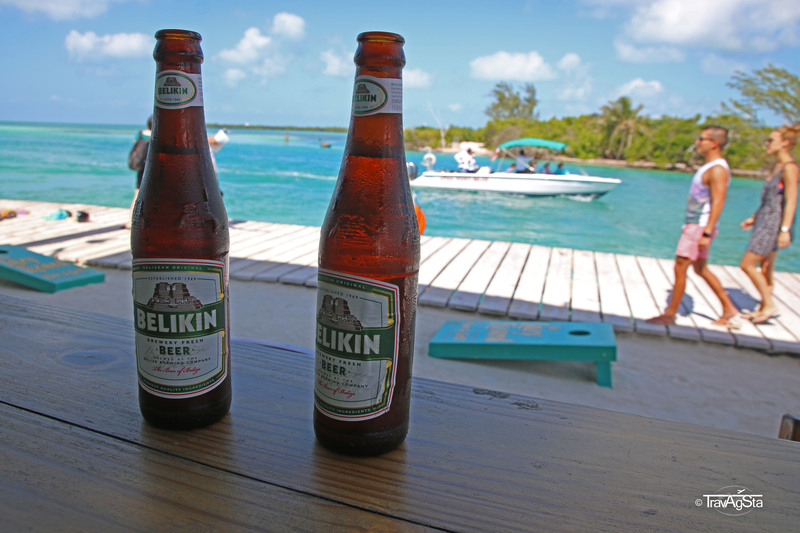 Afterwards we continued our trip to Caye Caulker. Including the immigration process, it took four hours to get there. It was a little bit exhausting but totally worth it. 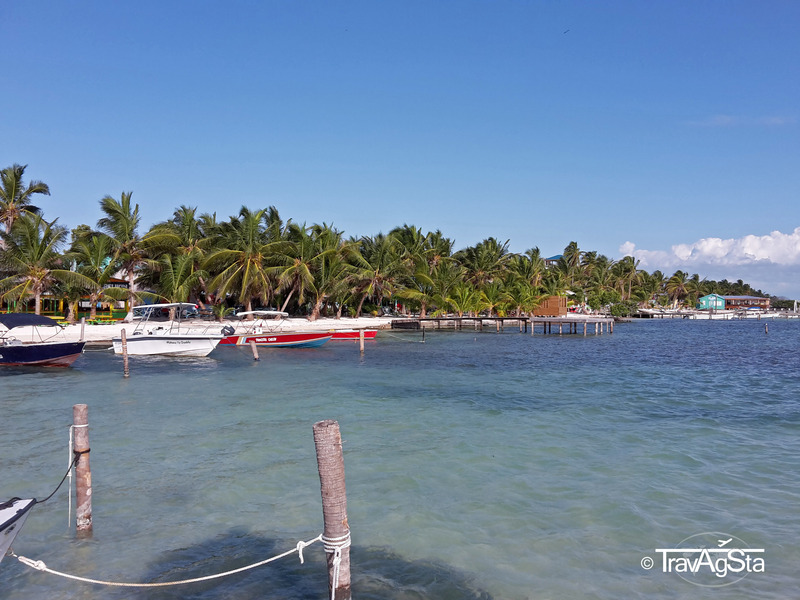 It is also possible to reach Caye Caulker from Belize City. The boat ride is shorter then, but the bus ride much longer. In short: Accommodation is a little bit expensive compared to the rest of Central America. But everyone should find something using the well-known booking pages like booking.com. Drinks and food are quite cheap in comparison. Especially during happy hour, there’s a battle of prices for the benefit of the drinking enthusiasts. But more about that in a separate post. 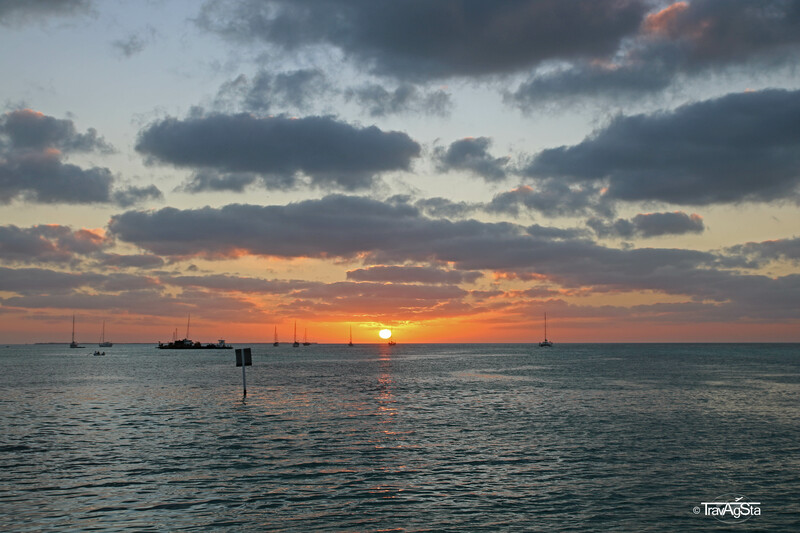 The Lazy Lizard – the place to be Caye Caulker! 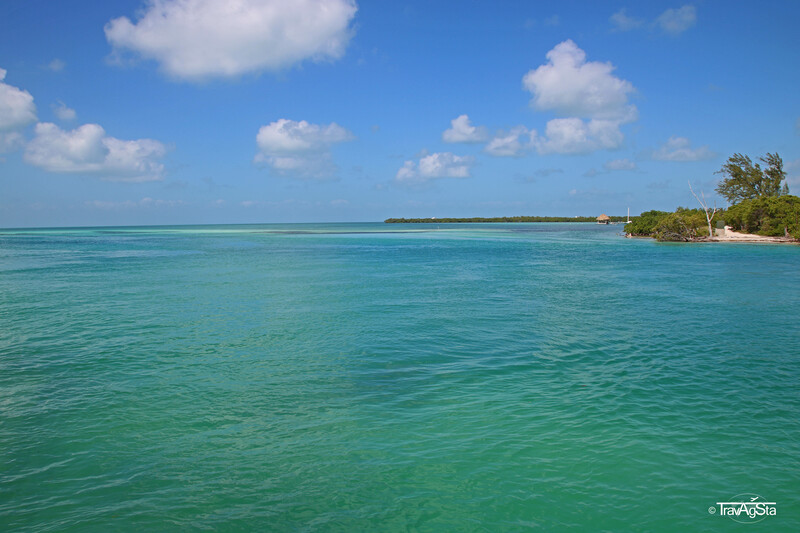 You can spend your days on Caye Caulker as you prefer. 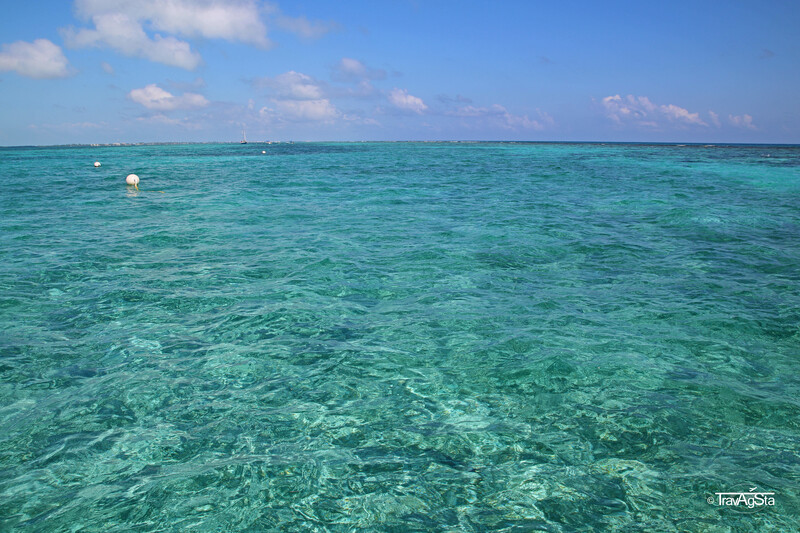 The only mistake you can make is not enjoying the amazing blue shades of the sea. 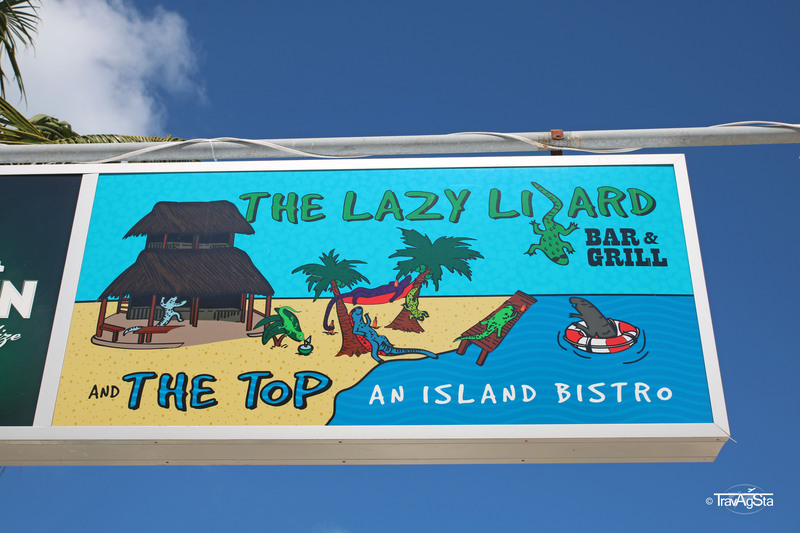 After a long breakfast, we decided to go to the north of the island to spend our precious time at the Lazy Lizard. 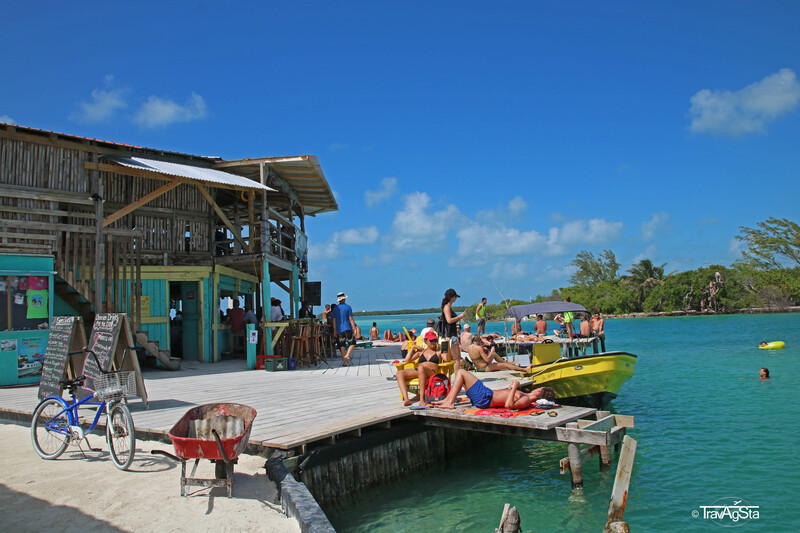 It’s a beach bar where you can eat, drink, swim, relax and meet interesting (local) people. And of course other travellers which make it kind of a ‘see and be seen’. But in an enjoyable and relaxed kind of way. People on the island take the ‘Go slow’ lifestyle really seriously. It is also a perfect, but crowdy spot to watch the sunset. 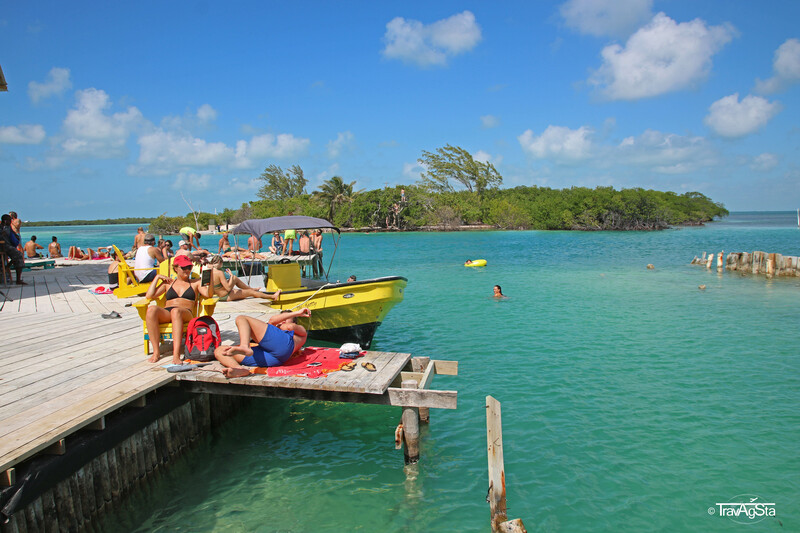 You can’t leave Caye Caulker without visiting the Lazy Lizard at least once. We loved the Lazy Lizard! 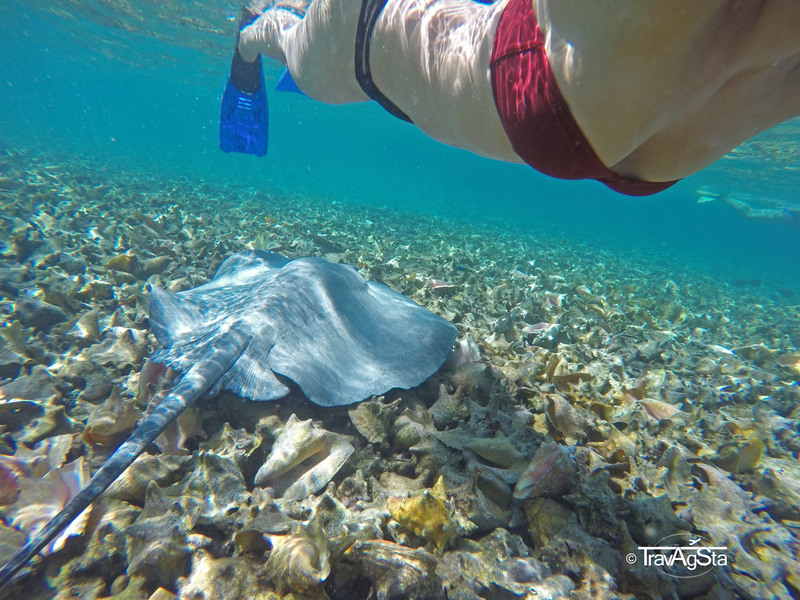 Caye Caulker is located perfectly for a snorkelling trip to the Belize Barrier Reef, the second largest reef in the world. There are a few tour providers on the island and prices are similar. We decided for the Caveman and loved it the full day tour. Just as mentioned at the beginning of the post, the Caveman himself is an attraction for itself. He’s really spreading the good vibes. 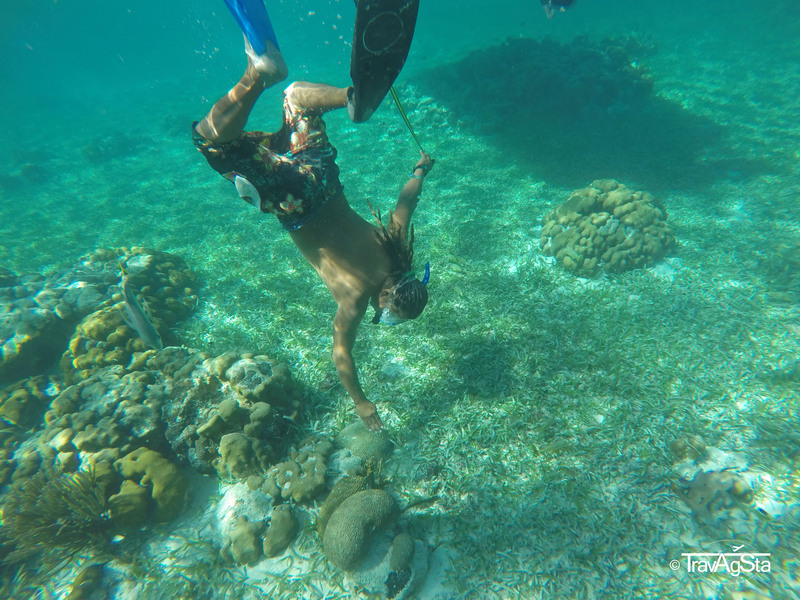 The trip took six hours and was $65 per person, including lunch, drinks, fees and snorkelling equipment. 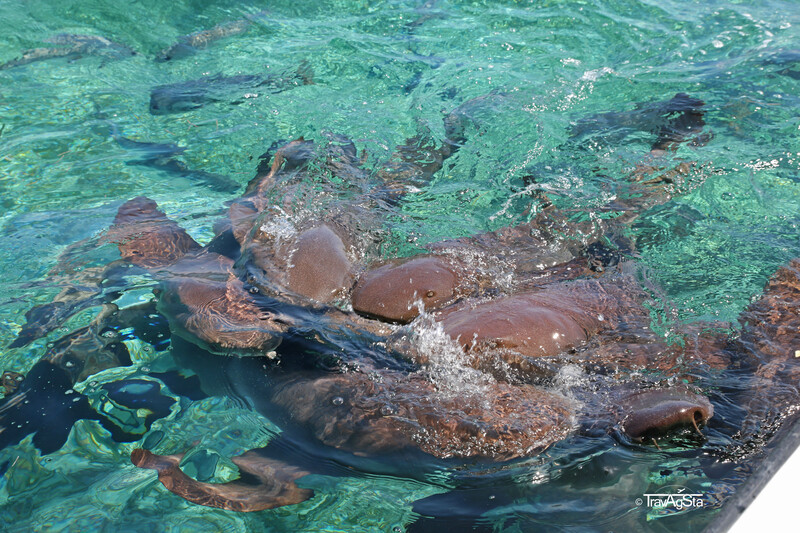 Visiting Shark Ray Alley: We already met the beautiful Nurse Sharks on the Bahamas. But it’s always an honour for us to see them again. 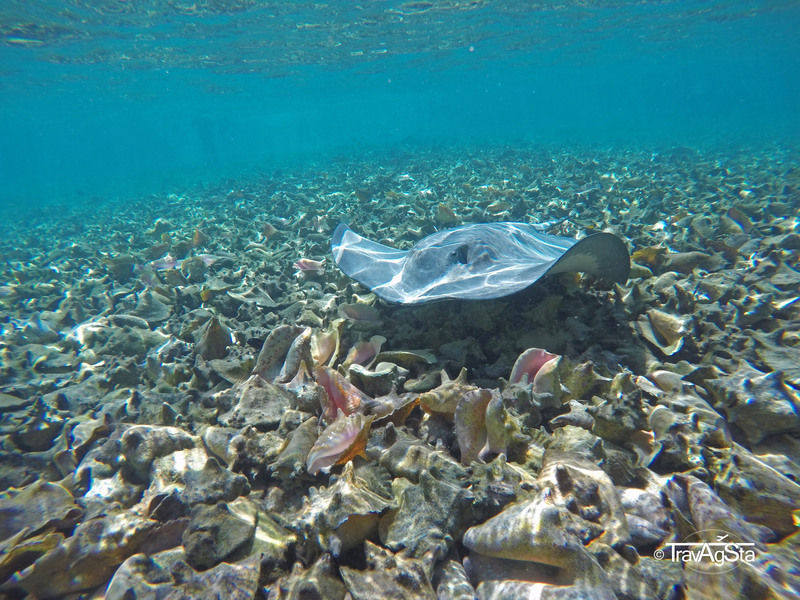 Fisherman’s spot: There’s a conch graveyard here. 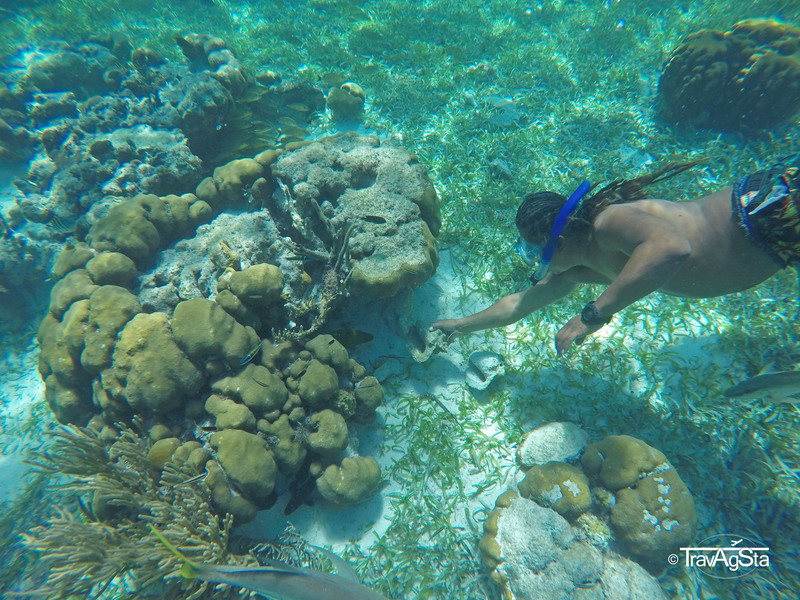 According to our guide, the same man comes here every day (for 48 years now) and feeds the turtles with the by-catch. 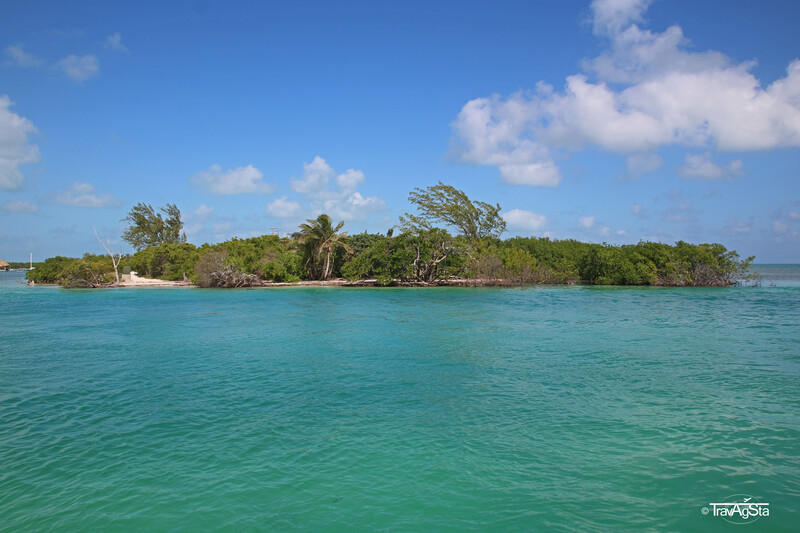 As this is a protected area (on the list of World Heritage in Danger), it’s forbidden to fish in this area. However, there’s a special permission for the old man as he’s kind of an institution here. 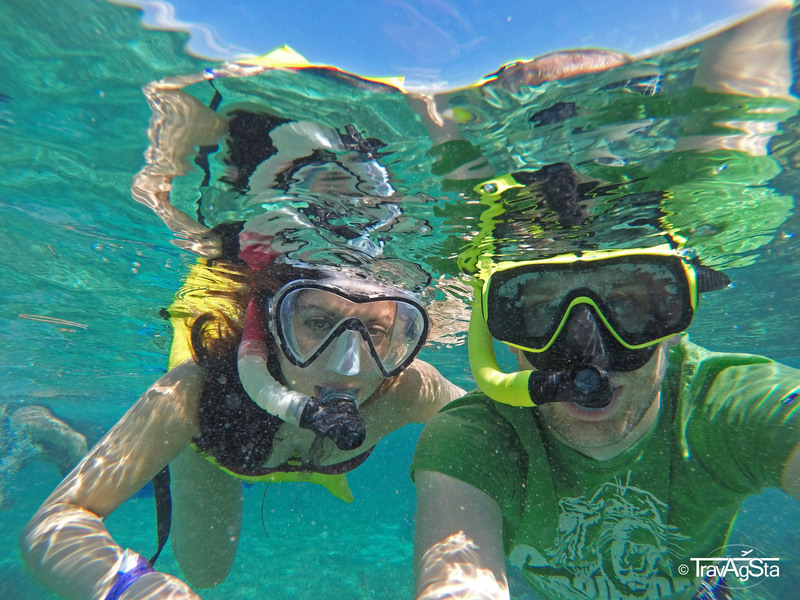 Our Snorkel Safari began at the Hol Chan Marine Reserve which was our favourite part of the trip. 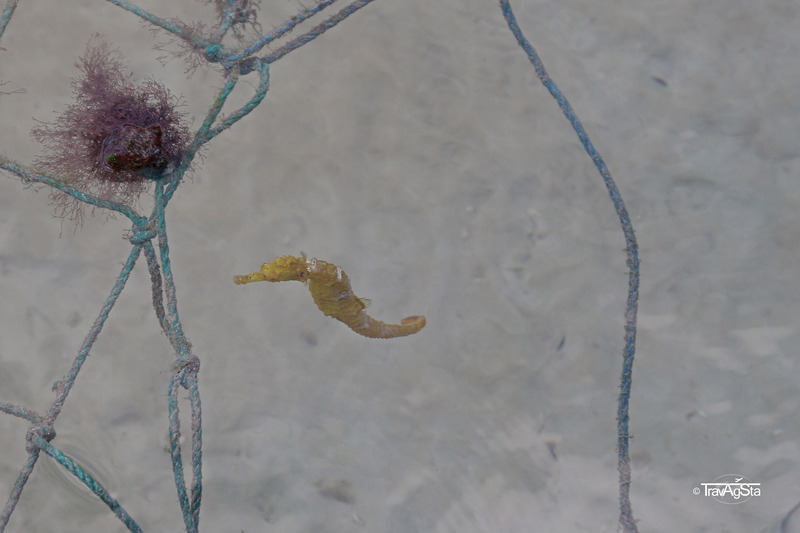 Our guide explained us a lot and showed us the weirdest sea dwellers. Of course, we forgot most of the names. But we definitely won’t forget the disgusting, green snaky moraine. 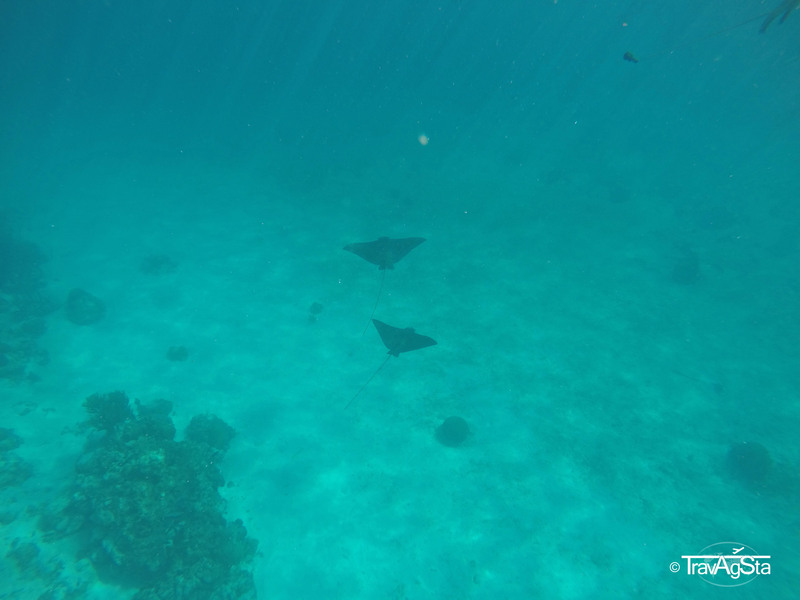 We saw Spotted Eagle Rays, sharks, an infinite amount of small and big colourful fishes as well as beautiful corals in all kinds of colours. 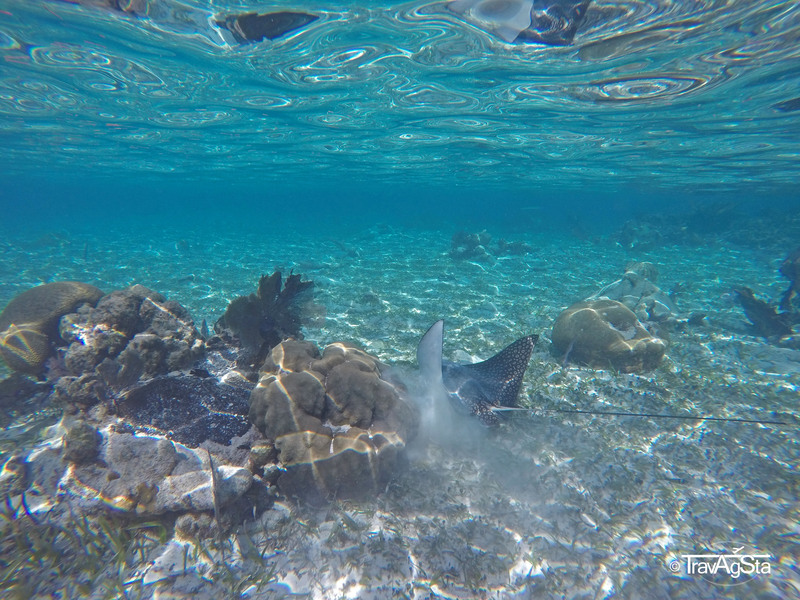 The water was crystal clear and seeing these animals in their natural habitat was just amazing. 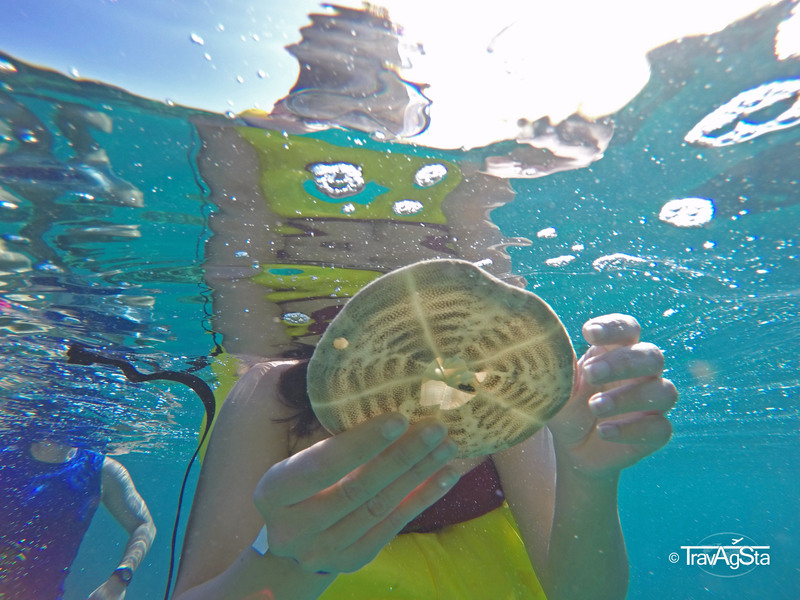 After the snorkel safari, we felt absolutely whacked but so happy to have experienced something like this. 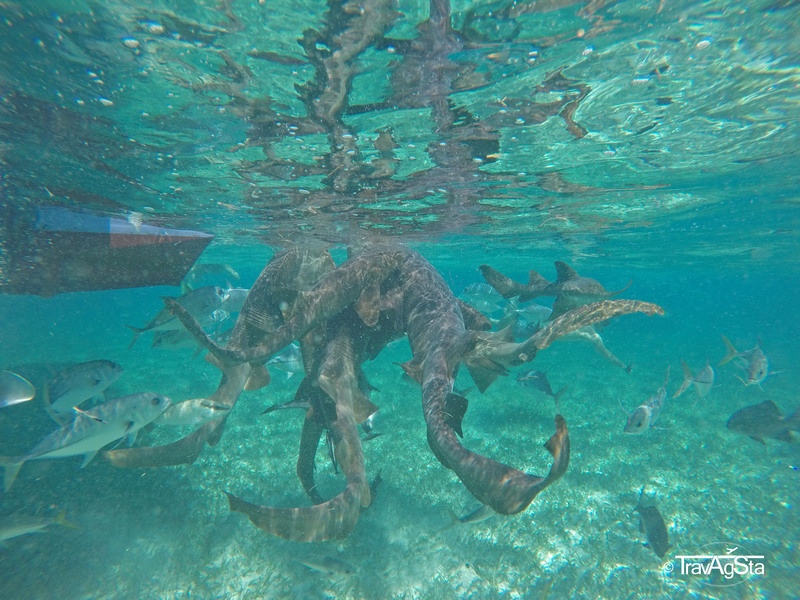 The snorkel safari was our highlight of the boat trip. The rest was not so impressive in comparison, also because we became tired. We had another stop at the ‘ship wreck’. First of all the name promises more than it actually is: just a small flat transport ship. Secondly, there wasn’t much to see there. In short: Unspectacular. 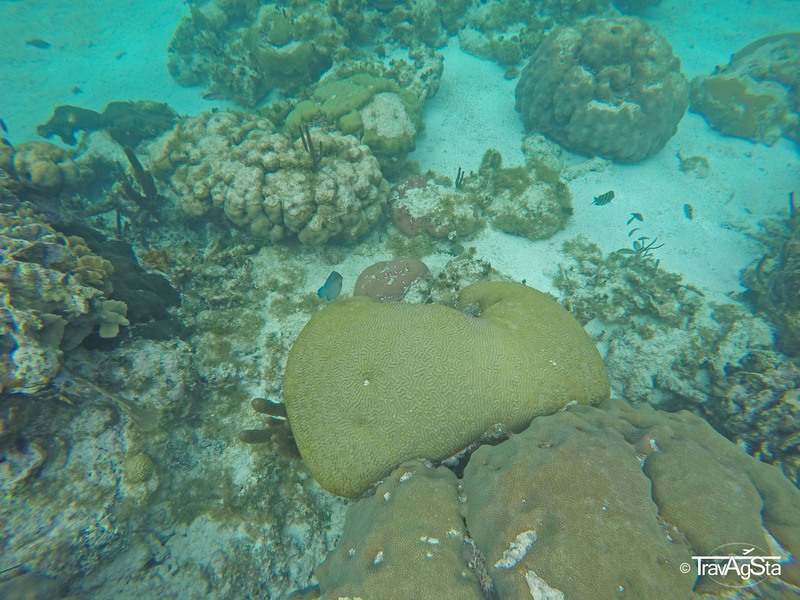 We made another stop at Coral Gardens which is beautiful. They could skip the ship wreck and spend more time here. 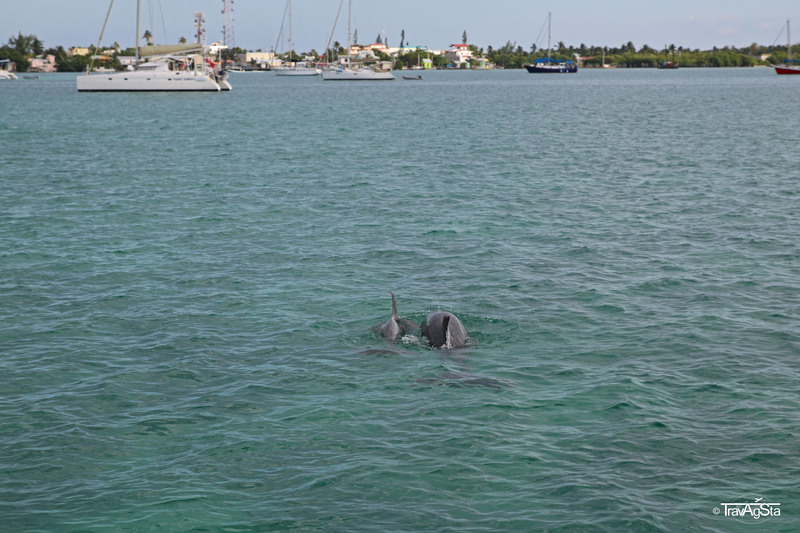 At the end of our trip, we saw two dolphins, seahorses and tarpons. However, the two latter can be seen from the island as well. And we finally saw turtles. 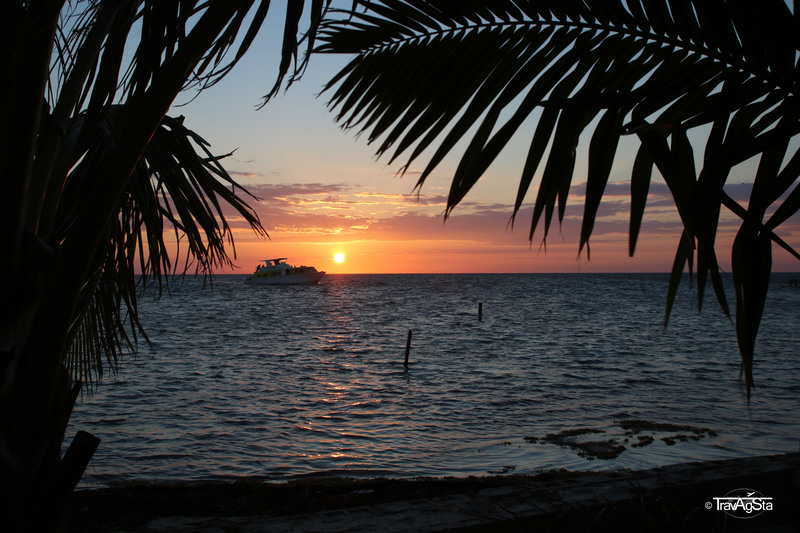 What turned out to be very difficult in Akumal was meant to happen in Belize. Unfortunately, we don’t have a photo of it, but they look better in a video (see above) anyway. 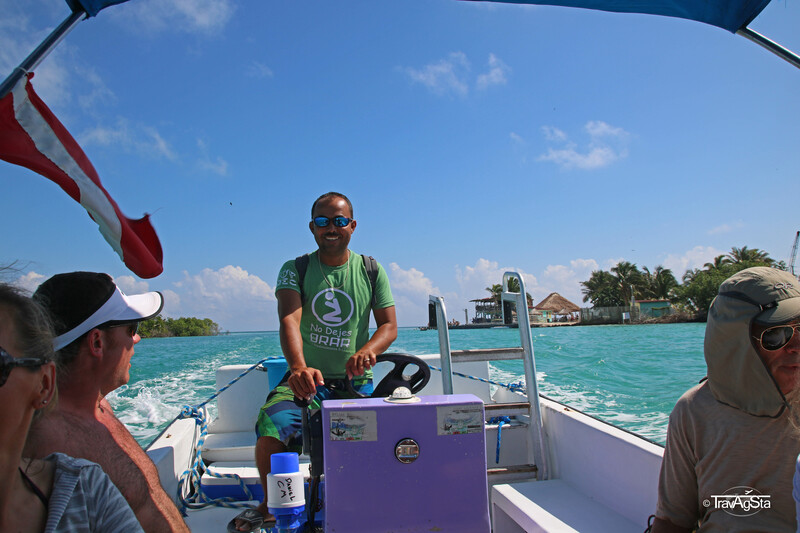 The boat trip with Caveman was the highlight of our Caye Caulker trip and we really recommend you to do this. 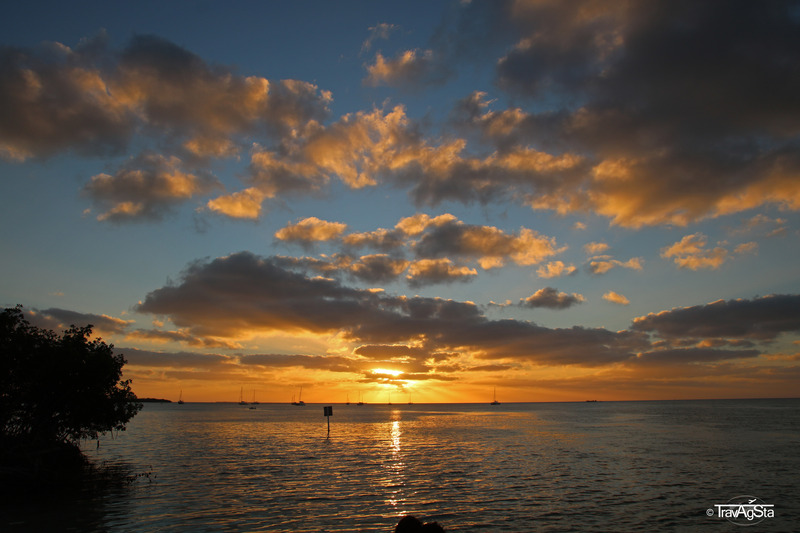 As the island is really small, getting from east to west to see sunrise and sunset is super easy. 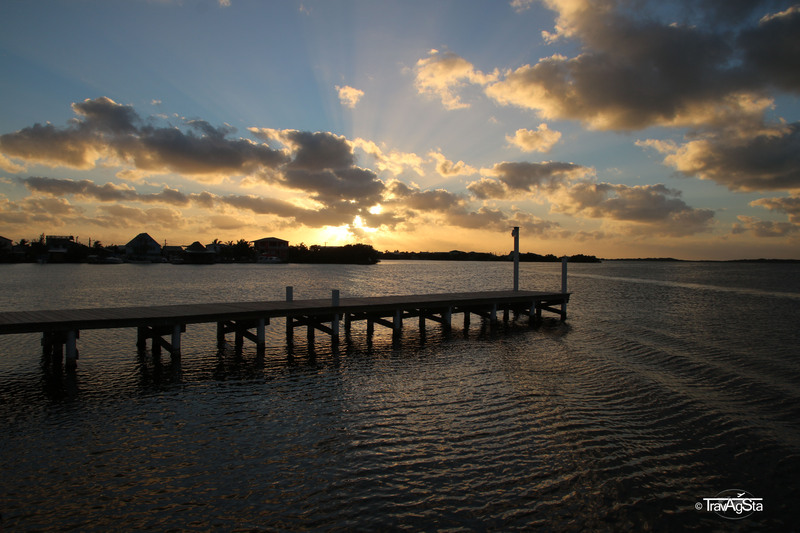 The island is perfect for relaxing. The atmosphere is amazing and I honestly wish to come back here one day and stay longer. 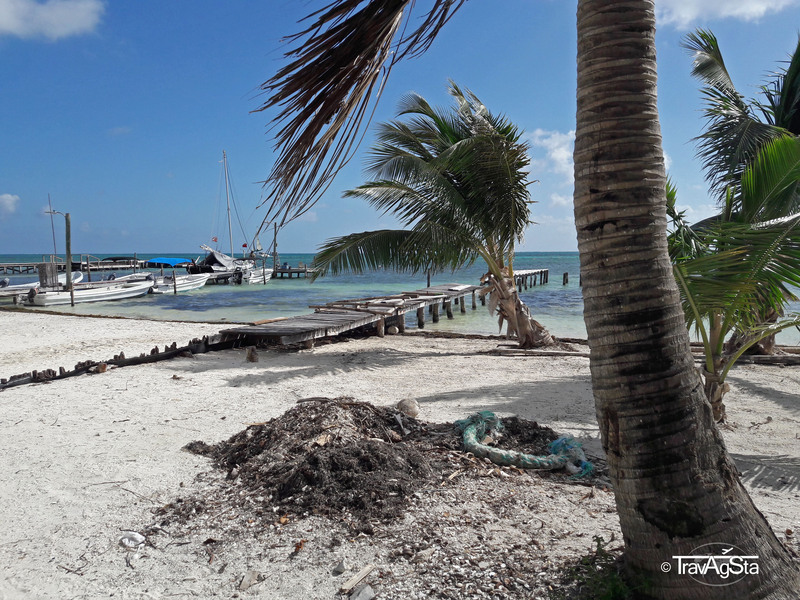 Caye Caulker is, without doubt, a synonym for paradise.